Play of the game: Down 7-6 late in the first half, Pitt punter Kirk Christodoulou bobbled a snap and was snowed under by Jarvis Miller at the Panthers’ 35. 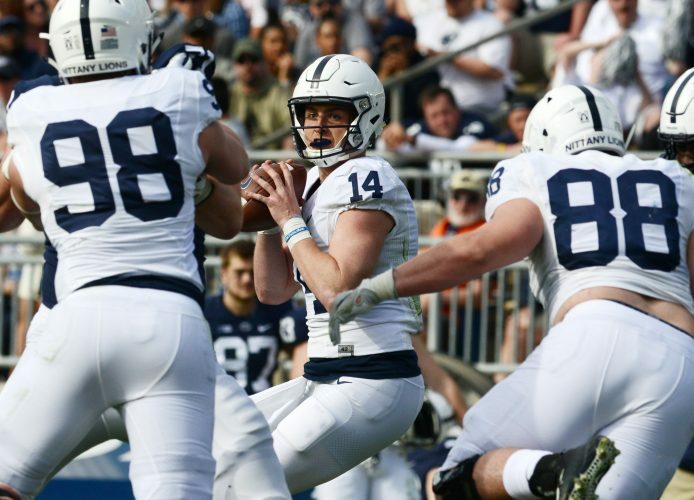 The Nittany Lions, stymied since their first drive, took advantage and scored their second touchdown to take a 14-6 lead with 26 seconds left in the half. Pitt never recovered. Offensive player of the game: Penn State tailback and Pittsburgh native Miles Sanders carried 16 times for 118 yards. He also caught a pass for 6 yards. Defensive player of the game: Kevin Givens of Altoona made his return from a one-game suspension and was credited with a career-high seven tackles, including two for loss and a quarterback hurry. Most telling statistic: Pitt was penalized 14 times for 116 yards. Penn State was penalized four times for 45 yards. Most deceiving statistic: The Panthers owned time of possession, 33:22-25:38. Hidden statistic: Pitt averaged just 33.7 yards on six punts. Best run: KJ Hamler’s 32-yard jet sweep for a touchdown opened the scoring on the Lions’ first possession. Best pass: Lion redshirt freshman Sean Clifford, subbing for No. 2 Tommy Stevens, lofted a 34-yard touchdown pass to Brandon Polk with 4:21 left. Worst pass: Trace McSorley short-hopped an open DeAndre Thompkins in the flat in the second half. Best return: Thompkins returned a punt 39 yards for a touchdown that extended the Lions’ lead to 30-6 with 28 seconds left in the third quarter. Best catch: Lion corner Amani Oruwariye perfectly blanketed Tre Tipton up the right sideline and intercepted at the PSU 1 late in the first quarter, stalling Pitt’s momentum. Catch it, will ya: It was wet, granted, but the Lions’ receivers had a bad day. Thompkins dropped two, including a touchdown pass in the third quarter. Hamler and Juwan Johnson also had drops. Oruwariye had a diving interception in his hands on Pitt’s first possession, but he dropped it. Hold it, won’t ya: Freshman tailback Ricky Slade fumbled twice, the first after he had secured a first down on a third-and-short. Best tackle: On second-and-10 from its 15, PSU linebacker Cam Brown dumped Qadree Ollison for a 4-yard loss to keep the Panthers pinned deep. Best block: Lions’ tight end Jonathan Holland helped spring Hamler’s 32-yard touchdown. Best hit: Pitt linebacker Quintin Wirginis jarred Slade’s first fumble. Best kick(s): PSU elected to punt from the Pitt 31, but Blake Gillikin made the decision look good by pooching one to the Panther 4. He also boomed a 52-yarder early in the third quarter. Worst kick: Pitt’s Alex Kessman missed a 35-yard field goal in the second quarter, keeping PSU’s lead at 7-6. Worst penalty: Down 14-6 early in the second half and having forced a third-down incompletion, Pitt defensive end Patrick Jones II decked McSorley for a roughing-the-passer penalty for that set the Lions up at the Panther 12. Three plays later, Penn State scored to take a 21-6 lead. Best call: On second-and-10 from the Pitt 35 with a minute left in the first half, Penn State pitched wide to Sanders, who weaved 21 yards to the Pitt 14, setting up the Lions’ second touchdown and a 14-6 lead. Worst call: Pat Narduzzi, even after a timeout, ordered an up-the-gut attempt on fourth-and-3 from PSU 4 late in the second quarter and the Nits up 7-6. No deception, and Penn State’s defense held. A field goal would have been better. Best effort: Penn State’s offensive line allowed just one sack on 31 dropbacks in addition to the run game averaging 6.4 yards on 33 carries. Unsung hero: PSU backup defensive end Shaka Toney made five tackles, including a sack and two for loss.